A TwinAir-engined Fiat Panda might sound like the perfect companion when going to the shops, but surely not for a world record drive from Cape Town to London? Well, yes actually. As that's just what British adventurers Phillip Young and Paul Brace have done in this 875cc supermini. Raising money for the charity Farm Africa, the pair set off on their epic trip at the start of this month. 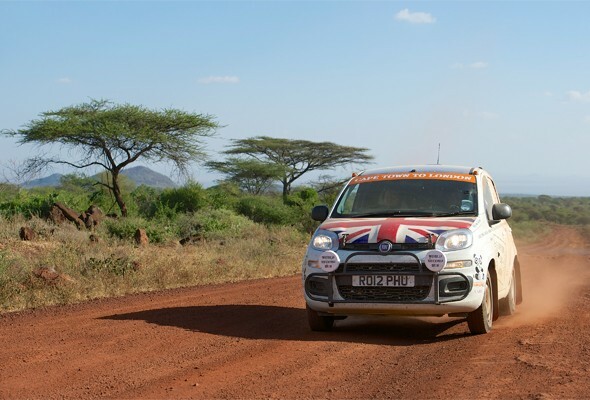 Having driven relentlessly through 13 countries and two continents, in the almost standard Fiat, they arrived at Marble Arch in London in 10 days, 13 hours and 28minutes later. This beats the previous record set, in either direction, by more than a day. They shunned off-roaders as they thought it would be too easy. Instead, the Panda was chosen for its lightweight build, performance and fuel economy. However, to break the record, the pair still had to average 1,000 miles a day at 40mph. The only changes over showroom spec, was an extra fuel tank, two spare wheels, sump guards, stronger springs and a modified air intake. The tough route to Britain included unmade, pot-holed roads and treacherous, dry desert tracks through South Africa, Botswana, Zambia, Tanzania, Kenya, Ethiopia, Sudan, Egypt, Libya and Tunisia before the pair crossed the Mediterranean for the final run up through Italy and France to London's Hyde Park. When interviewed about this experience, Philip Young said: "It has been a remarkable time on the road – exciting and exhilarating – and the Fiat Panda was amazing. The roads were treacherous, the heat unbearable and the timetable exhausting, but the car never missed a beat."